Hattusa, on the edge of the central Anatolian and Black Sea regions of Turkey is one of the country’s less visited attractions that was added to the World UNESCO Heritage site list in 1986. Don’t underestimate it’s historical importance, though. 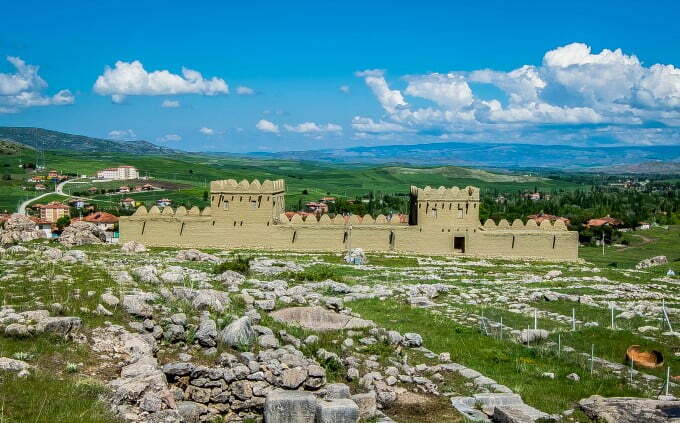 While the guidebooks overshadow it with the likes of Istanbul, Ephesus, and Cappadocia, it is equally significant when discussing past civilizations of Turkey, because Hattusa was the capital city of the ancient Hittite Kingdom. Since I was in Cappadocia that is only 3-hour’s drive away, I tagged it onto my trip with a stay in Bogazkale, the nearest village to the ancient historical ruins. Thanks to the severe nosedive in tourism this year, Turkey is brimming with cheap hotels , so I booked two nights at the bed and breakfast Hittite Houses, and a guide and driver for the tour. But before I went, I had to brush up on my virtually non-existent knowledge of the Hittite kingdom. Historians are unsure of where the Hittite civilization came from and went. They just disappeared from the vast historical timeline without a trace. Research and debates are still ongoing, but now, experts can only surmise that they integrated themselves into other cultures. Traces of their presence date from the 18th century BC but by 1190 BC, they were no more. As a god and goddess-worshipping nation, they instantly gained my admiration when I learned that women had equal status as men and even ruled alongside the Kings. Fast forward to 1834 and explorer Charles Texier discovered ruins while touring the region that had now become Ottoman territory. He thought he had found the ancient city of Pteria and subsequent expeditioners after him agreed. However in 1906, clay tablets bearing numerous inscriptions instead proved that it was the lost city of Hattusa, capital of the great Hittite civilization. 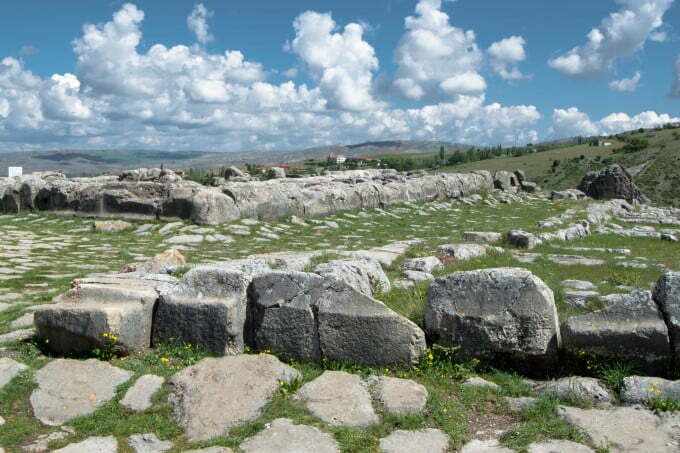 Hiring a guide/driver was the best thing I did because Hattusa ruins are spread out over a vast area of roughly 7 kilometres if walking. 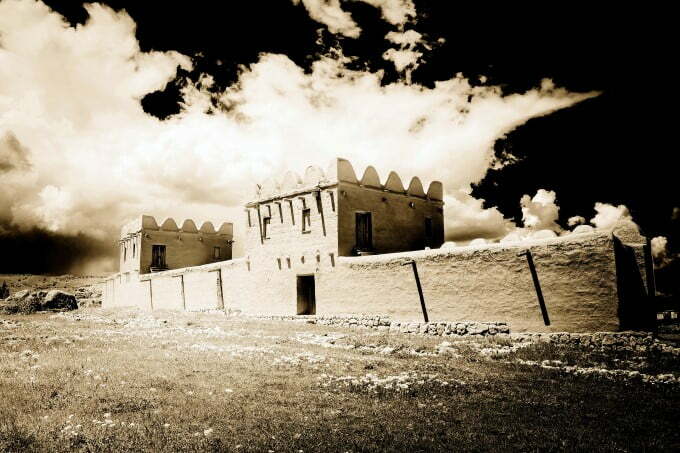 Entering via the main gate, the first sign of the ancient site was a part section of reconstructed city walls. The primary purpose of them was as defense since in those days, attempted invasions were frequent. 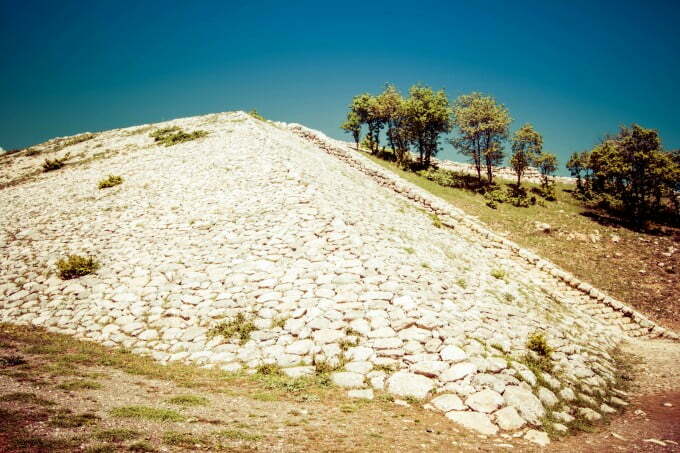 Reaching 15 metres high and stretching for 6 kilometres around Hattusa, they would have been a prominent landmark even from a distance.The reconstructed city walls section marks the beginning of the tour that then proceeds onto the lower part of Hattusa. Sadly, excavations are still happening, and only the bottom of the structural walls has been uncovered so I was extremely grateful for my guide, otherwise I wouldn’t have spotted the great temple that was the largest structure and landmark of Hattusa. 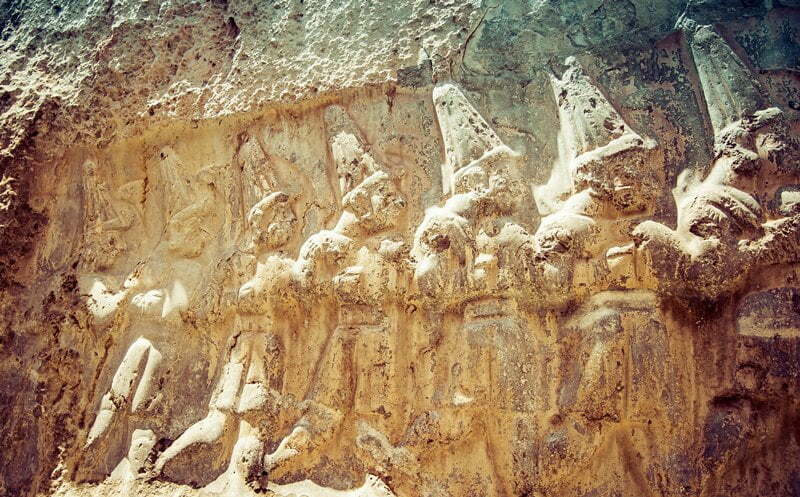 Also used as a place of sacrifice, it showcases the Hittites as dedicated god worshipers. 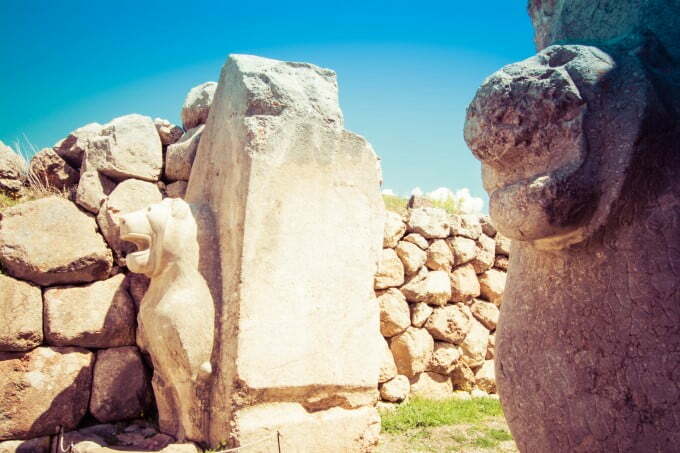 When other civilizations were captured, their gods and goddess were accepted and at one stage, Hittite men and women could choose from thousands of gods to worship. Nearby are the remains of houses and still on show are the original stone doorway entrances into storerooms. The gateway into the compound is also still evident, but the mystery in this section is the green stone. Sitting alone, the nearly perfect cubed structure was smooth to touch and obviously created by man from natural rock. At the same height as the bottom half of my legs, the colour was a dull but warming shade of green. 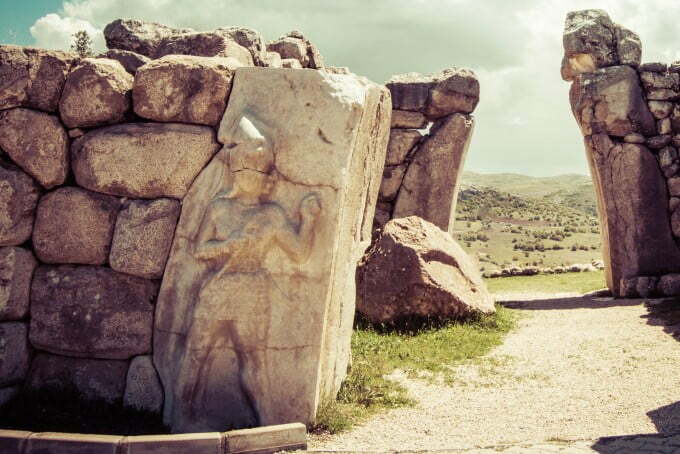 It seemed out of sort with other artefacts uncovered at Hattusa and historians and scientists agree that it did not come from some ancient alien race as a gift. Neither does it have special powers of a talisman or wishing stone but this didn’t stop me from touching the stone to make a wish. The mystery surrounding it was too much of a lure. 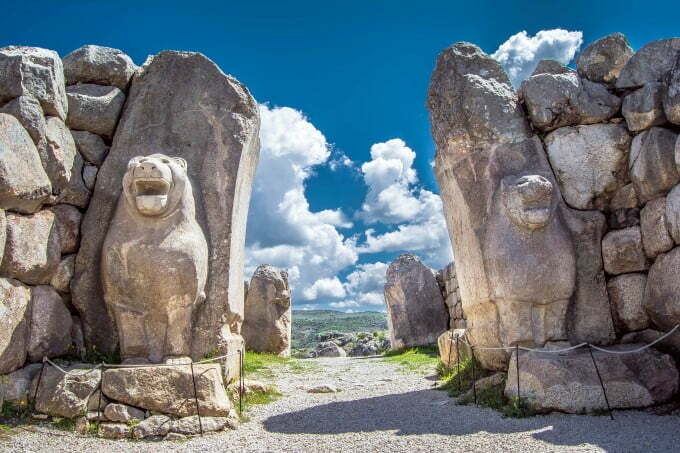 Driving into the upper part of Hattusa, the first stop was the ancient Lion’s Gate. Sadly, the current state of the gate reinforces my belief that sometimes Turkey should just leave well alone when it comes to historical artifacts. They have already messed up ancient mosaics in Gaziantep with botched restoration attempts and looking at the left hand side of the gate, they seem to have done the same because the lion just looks like a deformed gummi bear! 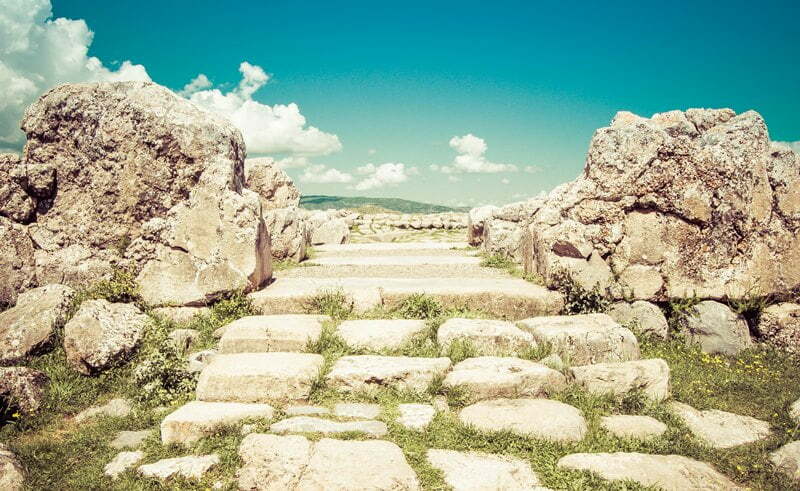 Built in the early 14th century, the gate was the commoner’s entrance to Hattusa and was locked and sealed at night. 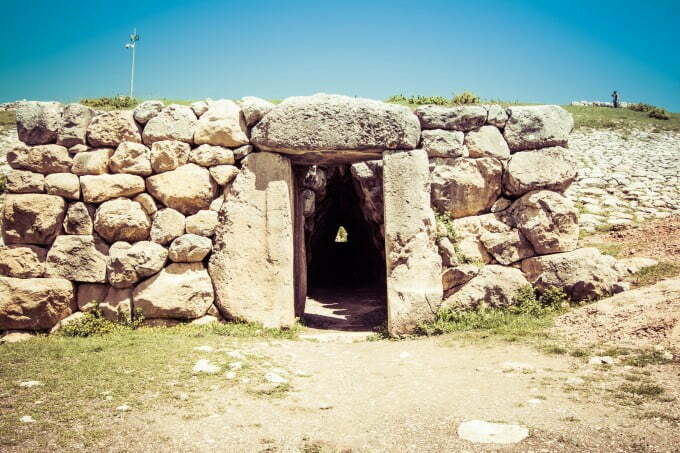 From this structure, historians are keen to point out the Hittite building technique of joining stones using steel rods and a grinding method so not even a slice of paper could pass between them. Looking at the walls supporting the lions, they resembled an expertly made jigsaw puzzle. The next prominent structure we drove to was the Sphinx’s Gate used by royalty or religious priests. 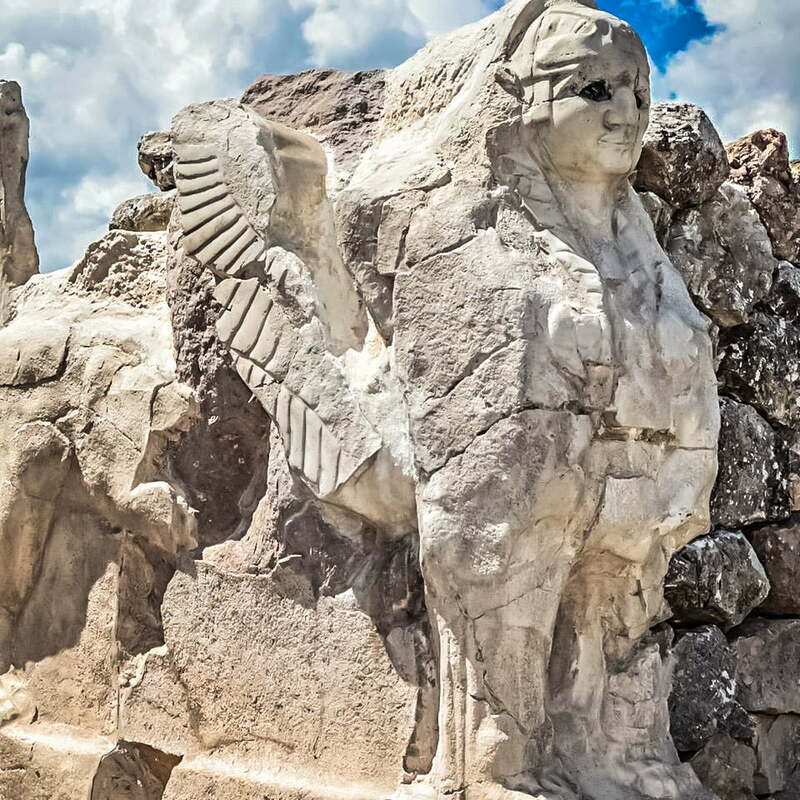 The Sphinxes on display now are copies, and the originals are in the Bogazkale Museum but more significant is the struggle for their return to Turkey. During excavations by Germans, they were taken to Berlin but in 2010, were given back after a Turkish government minister threatened to refuse further excavation permission. Sometimes you just have to lay down an ultimatum! Walking uphill, a scenic view of a nearby green area with wooden huts came into sight. Apparently, when excavation work takes place, workers stay in these cabins, but I instead veered to the left and carefully walked down an old flight of steps to turn around and view the rampart of Yerkapi of which I originally stood on top of. Instead of standing up straight, the rampart unusually leaned into the hillside and in the middle was a stone passageway about a metre wide and tall. While walking through it, I wondered if historians were sure that it was safe and there was no chance that this passageway could at any time collapse leaving me covered in a whole hillside of dirt. It was only a short distance, though, and my overactive imagination rested straight after when we emerged at the other side to witness a stunning landscape view of the surrounding countryside. This large structure is unusual because adorned on one of the stones, the sideways profile of a warrior has baffled scholars as to who it actually is. 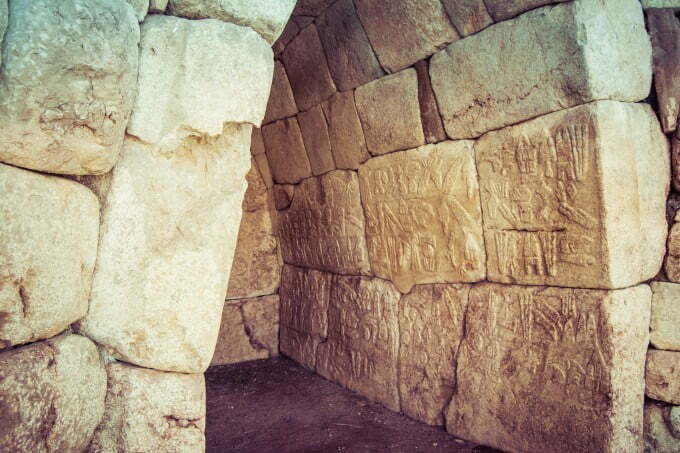 They initially thought it was an old Hittite king, hence, the name of the gate but this theory was disproven. The next suggestion was that it might be an ancient she Amazon warrior because of feminine shapes, but upon further investigation, abnormal amounts of body hair ruled out this theory. So although not confirmed, historians can only believe it is an ancient Hittite god. Never have I been so frustrated then when I stood behind an iron fence that barred entrance into the hieroglyph chamber. Desperately wanting to see them up close since my eyesight is not good at the best of times, I had to make do with explanations from my guide who confirmed that although it was initially thought to be an ancient tomb, historians now believe it resembled a symbolic entrance into the underworld. Now I have undying admiration for historians and excavation workers but on this occasion, I questioned their stupidity. 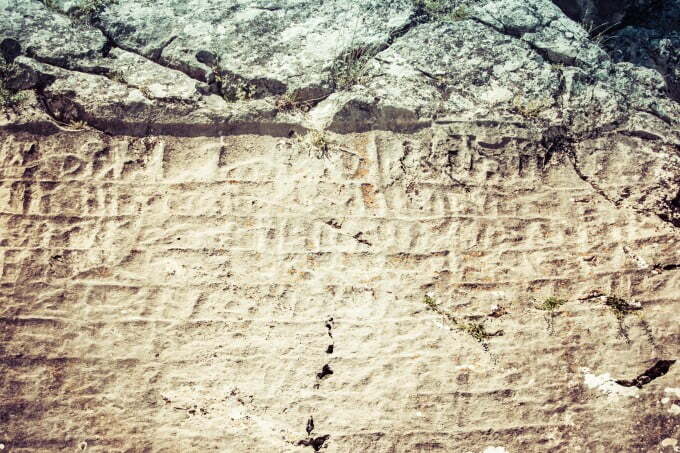 The Nisantepe is a giant 8.5-metre rock on which Luwian hieroglyphics were chiselled into. Unfortunately, bad weather elements have eroded much of the text making it hard to decipher what is actually written. There are mentions of prominent kings of Hattusa, but I cannot fathom out why this structure is not covered over because 100 years later, it will be totally undecipherable. Although there are more structures to be seen in this part of Hattusa like ancient Byzantine churches, we drove a short distance into the hillside to Yazilikaya, an impressive rock sanctuary with the chiselled resemblances of ancient Hittite gods and goddess. Walking up the stone steps, we passed chiselled replicas of great Hittite queens and kings but the highlight of them all stood between two large rock faces separated by only a few metres, and they were the 12 gods of the underworld. Wearing the typical Hittite features of skirts and shoes with curled-up toes, they also have pointed hats that reflect their status as divine. 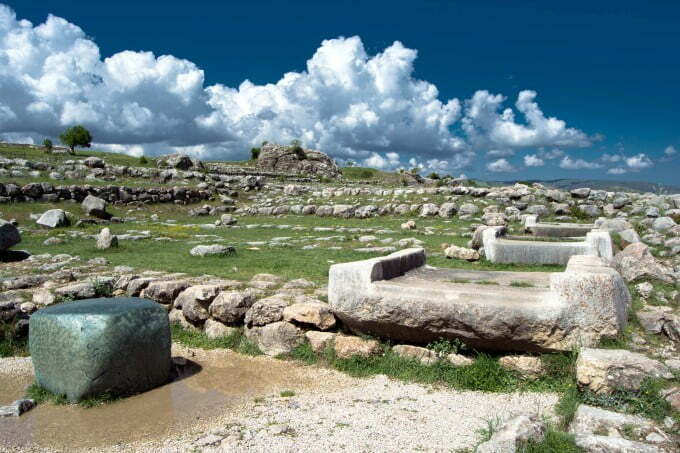 Hattusa is in Bogazkale that is a small village in the middle of no-where. I caught a direct bus from Cappadocia that took three hours and dropped me off in Yozgat. From there I booked a taxi transfer because there are no direct buses. Alternatively, if you are headed there from other directions, try to make it to Sungurlu from which there are taxis or small minibuses to take you to Bogazkale. Unless you are super fit, a car is needed for touring Hattusa and the nearby site of Yazilikaya. I booked my driver/guide through Hattusa Taxis of which their website is here. Both Deniz and Murat speak impeccable English so if you have any questions about getting there or touring the site, give them a ring. . . a very nice article Nat, and a timely reminder that it is 15 years since we were last there. 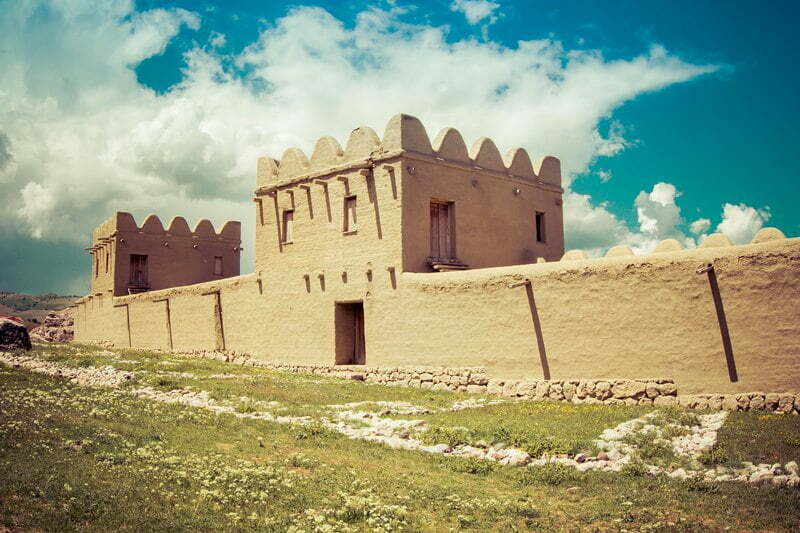 The place is impressive and the history of the Hittite Kingdom is fascinating. It’s great to see how travel cam take us back in time, but it is also a little sad how some of the restoration attempts ruin the artifacts. Great pictures!